﻿ Room Rates of Changbaishan International Hotel Beijing, Pay at the hotel reception upon check-in, Registration and Credit card are NOT required for booking! We provide Changbaishan International Hotel Beijing room booking at lowest price! 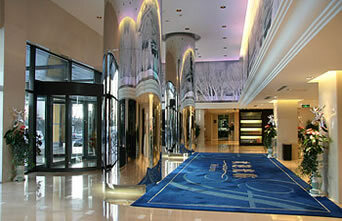 Bejing Changbaishan International Hotel accommodates 221 guest rooms in accordance with five-star standards. Rooms are equipped with full facilities including satellite TV, IDD/DDD, table light, air-conditioning, and private bathroom. 26 square meters of exquisite space, Superior Double Room with a king-size bed(180cm*200cm). Room rate includes single or double occupancy. High-speed internet free. 32-40 square meters of exquisite space, Superior Twins Room with two single beds(120cmX200cm). Room rate includes single or double occupancy. High-speed internet free. 32-40 square meters of exquisite space, Business Double Room with a king-size beds(180cmX200cm). Room rate includes single or double occupancy. High-speed internet free. 36 square meters of exquisite space, Executive Double/Twins Room with a king-size bed(180cm*200cm) or two single beds(120cmX200cm). Room rate includes single or double occupancy. High-speed internet free. 50 square meters of exquisite space, Deluxe Double Room with a king-size bed(180cm*200cm). Room rate includes double occupancy. High-speed internet free. Non-smoking floor available. 75 square meters of exquisite space, Business Suite with a king-size bed(180cm*200cm). Room rate includes single occupancy. High-speed internet free. Non-smoking floor available. * Extra bed is RMB228(USD36)per bed per night. © Copyright ©2008-2013 WWW.CHANGBAISHANINTERNATIONALHOTEL.COM. All Rights Reserved.